There are certain days that remain seared in one’s memory and mark a generation: September 11 is one of those days. For many of us who were working in Washington and New York during the attacks of September 11, that day remains vivid in our minds. It was a day that affected all Americans and continues to affect us today. To mark the 10th anniversary of the September 11, 2001 attacks, the National Museum of American History will provide a unique look at 50 historical objects saved from the three sites—New York City, the Pentagon and Shanksville, Penn.—as well as recent acquisitions related to how American lives have changed since then. 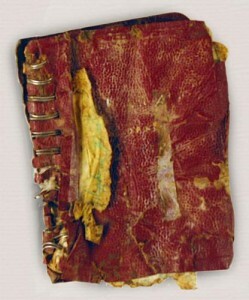 The flight crew logbook from United Airlines flight 93. This presentation will be a unique blend of a public program and a simple display of artifacts. The objects will be shown on open tables, without cases, and with short labels. Museum staff, docents and volunteers will be available to discuss the objects or answer questions, and visitors may leave their own stories by posting comment cards. Photographs from the museum’s collection will help provide context for each site. Also featured are video excerpts from a new Smithsonian Channel documentary, 9/11: Stories in Fragments, and a video presentation made by ABC News for the first anniversary of the attacks. This display will be on view for nine days only—Sept. 3 through Sept. 11—and open between the hours of 11 a.m. and 3 p.m. Staff and volunteers are invited to a preview on Friday, Sept. 2 from 11 a.m. to 3 p.m. For those of you who cannot see the display in person, there is a website which documents and preserves the stories of September 11 and provides a place to tell your own story. The Smithsonian Channel documentary will premiere Sept. 5 at 9:35 p.m. The film will also be shown in its entirety in NMAH’s Price of Freedom Theater during the nine-day run of the display and is also available online.